While many will view this page as me saying “Look what I’ve done”, most of those that have come along many of the journeys with me, will understand that it’s my ability to surround myself with really good, solid, trustworthy and helpful people in order to get something done. Just happens that I’m occasionally presented with either a “challenge or opportunity” that I truly believe will benefit the baseball community at large, and my instinct is to “start hammering away at it”….YOU decide if the results below speak for themselves as presented. The REAL purpose of the list though, is to give those that DON’T know me, the sense that the items listed under “Current Goals”, aren’t necessarily insurmountable if there's enough hard working, dedicated individuals out there willing to take the risk in "making things happen"! Took the first ever DISTRICT 6 SELECT TEAM to the 2017 Baseball BC Provincials… While many thought “we’d get killed”, only a loss in the bottom of the 7th inning in the Semi-Finals prevented us from going to the Westerns….Or POSSIBLY the Canadian Nationals. Started the Richmond Little League Program in East Richmond on a makeshift diamond. 27 players – who had NEVER played the game before - became the inaugural teams… While many challenges still lay ahead, a new parent group – with the support of both Richmond Baseball and TDC - are going to continue to address them going forward. Started the FIRST “Just Play Ball” program in Richmond a few summers ago and put through approx. 120 kids throughout the summer… Like many things we’ve believed in, others – like the local baseball association - eventually get on board and follow suit. Established what is now Richmond’s longest running full size Indoor Batting Cage Facility – The BallYard. It took some doing, but it’s now used by players and teams in multiple sports from the North Shore, Maple Ridge, visitors from outside the Province, etc. That said, we’re looking to make improvements there each and every day. With fellow TDC Directors, took on the challenge given to us by John Mills of the Richmond Olympic Oval. To give him a reason “not to say say no” when asked if we could actually Winter train in the Oval complete with batting cages…. While most said at the time “It will never happen”, countless weekends of packing TDC equipment into freight elevators, sending emails to countless groups to come utilize, etc, etc paid off as you can see today…NOTE: The local baseball association, at the time, didn’t want anything to do with it... As mentioned above, they eventually came around to utilizing this facility as well. Funded (and saved in the eyes of some..nearly broke in the eyes of others), the 2009 DC BASEBALL PROGRAM…. Remained the GM there for 3 years until the College hired full time Prof and Head Coach Cav Whitely…. Happy to say that we continue to foster the relationship to this day. (Including their funding requirements in a SURPRISE run to the NWAACC Championships a few years back). As a Director of B.C. Minor Baseball, and with the support of then President Frank Garnett, we established the B.C. Minor Jr Men’s Div amongst a constant cloud of pessimism. … “That age group won’t play baseball anymore…And if they do, it’s in the LMBA” was echoed more than enough times. After many, many emails – and the support of strong baseball guys like Ron Suffron of NWLL and Tony Croasdale of Newton Baseball – the league got off the ground. It continues to flourish today, and admittingly by LMBA supporters, it’s been a “benefit” to them as well… (As opposed to the enemy when the idea was first presented). As the GM of Richmond City Baseball’s Midget AAA Chuckers (and 1st Coach of their inaugural Jr. Men’s team), we began pushing hard to find a way to put a true Artificial turf field into Latrace in talks with soccer’s Roger Barnes.. (As it had it’s opponents)… The city itself presented the opportunity and we jumped on board…After spending about a year and half on the Minoru Parks Makeover Committee – in which I tried to get as much input from all baseball groups as possible – the park came to fruition. While not entirely as recommended, it’s still a facility that’s now being searched out by many in the early part of the season. Which is partially the reason for one of our current goals. While extremely reluctant for the longest period of time, we stepped in and saved a SUMMER OF COLLEGE BASEBALL for the Victoria Royals Baseball Club. While it didn’t quite work out as hoped – for political reasons – many friends came out of the experience that last well into today. Became a “Founding Director” of Richmond City Baseball and eventually passed along the name put away and “promoted” many years earlier by a couple of us long time "Richmond Baseball" guys.. (See pics of T-Designs originally being sold by myself and fellow TDC Director, John Kapp). 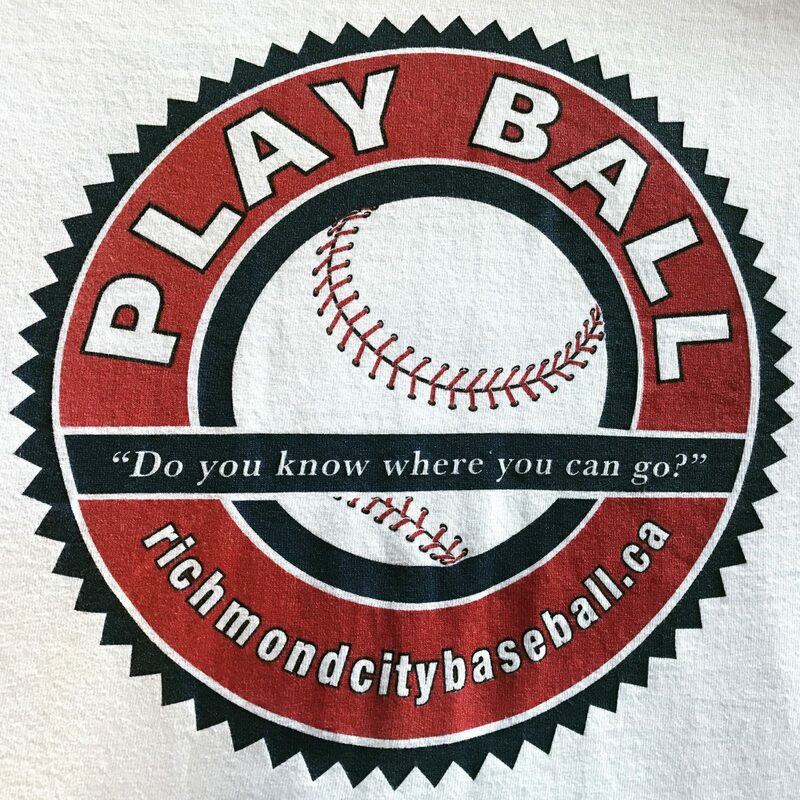 Established West Richmond’s very FIRST Bantam and Midget teams after a year long battle with BC Minor Baseball… This after convincing then WR President, Pat Weatheril, that the way to “bring the associations together”, was for WR to get on equal footing with Richmond Baseball as to the ages they offer…. We played our first season at Latrace Field and Minoah Steves…. The following year, BOTH boards found their way to each other… Funny how that worked out, heh? Survived being hit in the head by the first pitch I ever faced - thrown by current RICHMOND SOCKEYE OWNER, DOUG PATERSON - as an 8 year old. It was1963 at Tait School and I went into the game as an unregistered player just filling in with my older brother’s MAYLEIGH FARMS team…… I only share this with you, as it may explain a lot of what’s taken place since that time!! While I’ve listed off a number of things here, I fully hope that MANY of you will care enough about the things we’re trying to accomplish going forward, that you’ll go ahead and “fact check” everything and anything above with those that are aware of the events. And THEN if comfortable and/or interested in knowing more about or supporting our efforts, please drop me a line.